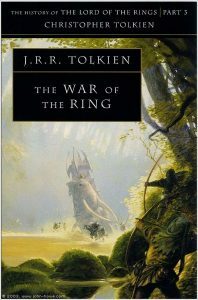 Tolkien’s The Hobbit and The Lord of the Rings are, of course, his best-known works, much loved and read (and often re-read regularly!) but countless people all over the world over the years. But these two works are only the tip of the iceberg of an extended mythology, which most readers know today from the posthumously published Simlarillion, edited by Christopher Tolkien. The Silmarillion traces the history of Tolkien’s imaginary world over millennia, including a cosmogonic myth (the “Ainulindalë”) and a great number of interrelated legends and tales from the First, Second and Third Ages of Middle-earth. But this isn’t all. The Silmarillion represents only a ‘late’ conception of the Middle-earth mythology, and it was still a work in flux when Tolkien died. 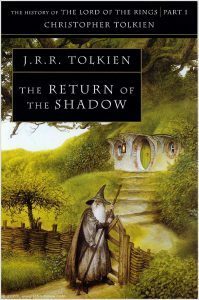 To address this problem, Christopher Tolkien undertook the enormous task of editing and publishing thirteen volumes of Tolkien’s Middle-earth writings over sixty years, showing the evolution of his mythology: the 12 volumes of The History of Middle-earth, together with Unfinished Tales. I am often asked about these books, by students and visitors on this blog, so I thought I’d give a quick overview of their content and – perhaps – inspire more readers to consider them. As for budding Tolkien scholars, they will need to read all of these volumes (we are well past the time when one could ignore them!) so this outline may make the task a little less daunting. The first five volumes of The History of Middle-earth largely represent the evolution of Tolkien’s mythology before the writing and publication of The Hobbit and The Lord of the Rings. The first and second volumes (1983–4) present The Book of Lost Tales, written in the 1910s and 1920s. They also include many of Tolkien’s early poems, written before and during the Lost Tales. 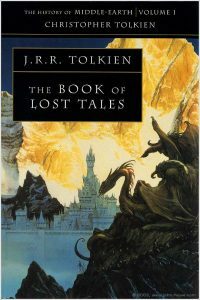 One of the main differences between the Lost Tales and the published Silmarillion is in the presentation of the mythology through a ‘framework’ and a ‘mediator’: the character of Eriol (later called Ælfwine) is a traveller to the isle of the Elves, where he hears their stories and records them for mankind. 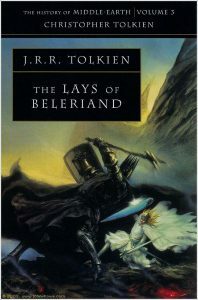 The third volume, The Lays of Beleriand (1985), includes two long poems: one on the story of Túrin, and the other on the tale of Béren and Lúthien, all written during 1921–32. These poems represent a period in Tolkien’s creative expression of his mythology when he turned from prose to verse. But writing in verse proved to be temporary: both poems were left unfinished. 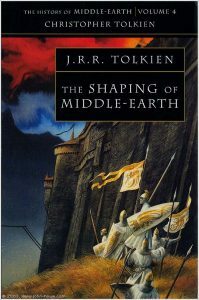 The fourth volume, The Shaping of Middle-earth (1986), contains the Sketch of the Mythology, which is a prose synopsis of Tolkien’s mythology written in 1926. In this short piece, Tolkien tries to ‘explain’ how his vision of the long poem on the story of Túrin fitted within the whole legendarium. Tolkien wrote this summary of his mythology for the benefit of his former schoolmaster, R.W. Reynolds, to whom he had sent the poetic version of the Túrin tale, asking for his comments. After the Sketch, Tolkien returned to prose for good in Qenta Noldorinwa, which also represents his next attempt to record his mythology. The Sketch of the Mythology and the Qenta Noldorinwa are the only complete accounts of the legendarium covering the whole of the First Age of Middle-earth from the arrival of the Valar in Arda to the overthrow of Morgoth. At that stage of the mythology’s evolution, no Second or Third Ages had yet been conceived. The matter of Númenor along with the setting of The Hobbit and The Lord of the Rings had yet to be invented. 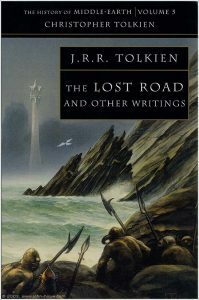 The fifth volume, The Lost Road and Other Writings (1987), introduces the story of Númenor into the mythology. 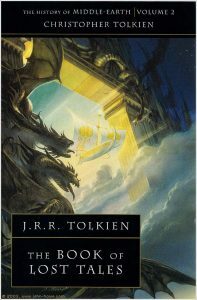 Written around 1936–7, it contains the first version of the legend of Númenor, The Fall of Númenor, and Tolkien’s first abortive time-travel story, entitled The Lost Road. Closely associated with the Númenórean material, The Lost Road involved a series of fathers and sons reliving northern European myths and legends through dreams, concluding with the fall of Númenor from Tolkien’s own mythology. 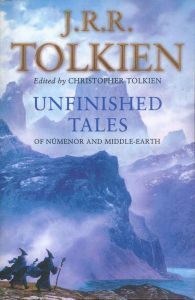 Finally, the volume contains Tolkien’s fourth attempt to record the entire narrative of his mythology: the unfinished Quenta Silmarillion, written between the mid-1930s and 1938. By 1937, Tolkien’s story The Hobbit, originally created to amuse his children and initially conceived as independent from Middle-earth, was published. After its success his publishers asked for a ‘sequel’. Instead, Tolkien offered them his private mythology: the incomplete Quenta Silmarillion and a few other texts. The work was rejected, but Tolkien was still very much encouraged to write another story about hobbits. He started writing it reluctantly in the beginning, but soon realized that the story was growing into something different than a mere children’s story. The next four volumes (VI-IX) of The History of Middle-earth record step-by-step how Tolkien created The Lord of the Rings, following his creative path from manuscript to manuscript during the period 1937-50, including rejected versions and revisions. During this time Tolkien stopped working on his mythology and devoted all his time to the ‘new Hobbit’ his publishers had requested. The Notion Club Papers, written between December 1945 and August 1946, represents the only period during which he deviated from his task. 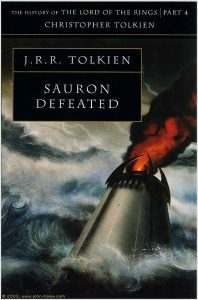 Tolkien wrote The Notion Club Papers as a time-travel story; it is included as the second part of the ninth volume of The History of Middle-earth entitled Sauron Defeated. Similar in theme to The Lost Road, this story was also left unfinished. In The Notion Club Papers the dreamers travelling to the past are Oxford dons belonging to a literary group called the ‘Notion Club’, similar to the Inklings group that C.S. Lewis and Tolkien belonged to. In this work the dreamers travel back in time, mainly to places from Tolkien’s own mythology like Númenor and Valinor. The Notion Club Papers was not just another attempt to write a time-travel story, but also a narrative experiment to find a ‘framework’ for presenting his whole mythology. Instead of using a ‘mediator’, like Eriol/Ælfwine in The Book of Lost Tales, Tolkien seems to have considered time travelling as a way of ‘introducing’ his legendarium to readers. After the great success of The Lord of the Rings, the publication of The Silmarillion was finally a possibility. 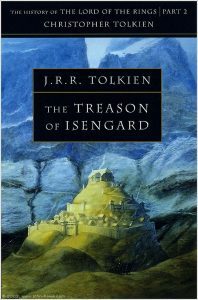 The Appendices of the former had whetted the appetites of readers for the myths and legends of Middle-earth. 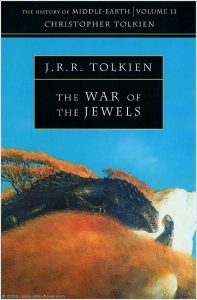 The last three volumes of the History of Middle-earth represent Tolkien’s efforts to fulfil this demand by attempting to compile a mythology fit for publication. 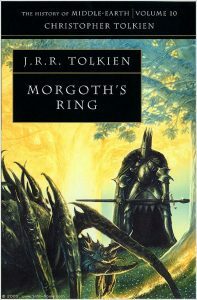 The tenth and eleventh volumes of the series, Morgoth’s Ring (1993) and The War of the Jewels (1994), include the Later Quenta Silmarillion. From 1950 to the mid-1960s Tolkien returned to the earlier Quenta Silmarillion to rewrite large parts and make changes, but the work remained unfinished. At the same time he wrote a plethora of other texts related to the Quenta Silmarillion. These texts included essays on specific characters, moral and theological issues raised by his mythology, as well as parts of stories from the mythology rewritten in a different prose form. 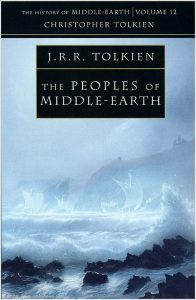 Many of these texts are included in the twelfth volume of the series, The Peoples of Middle-earth (1996), which also records the compilation of Appendices to The Lord of the Rings. Some of these late texts are also found in Unfinished Tales (1980). Would you mind if I translated your excellent post into Portuguese for the benefit of Brasilian Tolkienists? I would, of course, give complete credit and references. This is the kind of job my countrymen expect of me as almost-standard translator of JRRT’s works – some 10 in the past, and now working on “Beren and Lúthien”. An e-mail reply would be welcome. Yes, I am happy with this! Let me know when you have a link for the translation. I have just published a translation on my facebook page “Explicando Tolkien” [Explaining Tolkien], which is also the title of a book I published some time ago.